September | 2007 | It's a MicrobeFul World! When bacteria were called viruses! The word “virus” was used in the past to refer to any poison (Latin: virus = poison), such as snake venom, and was later used to describe the causative agent of any infectious disease. Pasteur often referred to pathogenic bacteria as viruses, but by the end of the nineteenth century, things have changed and infectious agents smaller than bacteria kept the name “filterable viruses” or viruses. Read about bacterial structure in Todar’s Online Textbook of Bacteriology or USC School of Medicine Bacteriology, Chapter One (you may even download the whole lecture from this page, or see the presentation and listen to the lecture here!). Isn’t all this amazing? 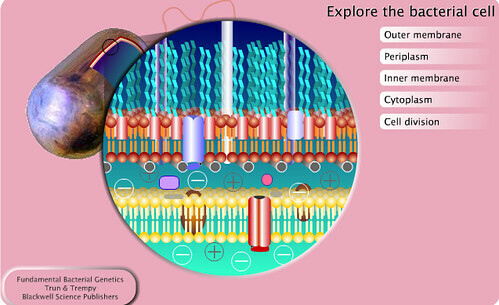 Check the “Explore the bacterial cell” interactive animation (by clicking on the image below). Try to find out the function of each part of the cell. Bacteria become more virulent in a space shuttle? Will bacteria become more dangerous if they travel in the space in a “weightless” environment? Why would bacteria travel to space to start with? 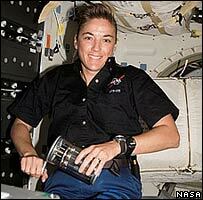 Obviously it could only happen in a space shuttle! “Wherever humans go, microbes go; you can’t sterilise humans. Wherever we go, under the oceans or orbiting the Earth, the microbes go with us, and it’s important that we understand… how they’re going to change,” Cheryl Nickerson, from the Center for Infectious Diseases and Vaccinology at Arizona State University, US, told the Associated Press. Classification and Identification of Microbes. The following are the learning objectives for this lecture. Use them as review questions to guide you through your study. They tell you what is more important in this chapter… Feel free to suggest more questions and to ask for details in the comments section. Please include your name and student# if you wish follow-up on your questions. Note: The learning objectives are mainly taken from Bauman’s Microbiology which is one of the textbooks I use to prepare your lectures. * Discuss the purposes of classification and identification of organisms. * Discuss the difficulties in defining species of microorganisms. * Describe the historical attempts to classify living organisms. * List and describe the three domains proposed by Carl Woese. * Compare and contrast bacteria and archaea. * Mention the main differences between rickettsiae, chlamidiae, and mycoplasma. * Mention the different bacterial shapes. * Mention the differences between spirochaetes and spirilla. * Discuss whether viruses are living organisms. * Describe how viruses and prions propagate. If you can answer the above questions, you know it all! Third-year students: welcome to the world of microbes. This is a special message to the third-year students of the Faculty of Pharmacy, Cairo University. In the next few lines, I hope to introduce you to this weblog (created in February 2007) that aims to be a learning tool of microbiology and immunology, but also a place where you can express your thoughts about this exciting science and your opinions about the course as well. The third year’s first semester is focused on general microbiology, microbial genetics, and immunology (teaching team), while the second semester is a medical microbiology course. You will find at least the first four textbooks in the library.